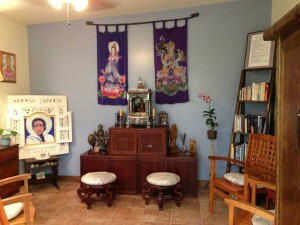 This room is also where Eve does private coaching and can be made available for other private healing sessions, meditation classes, and readings. Goddess Tara, a female Buddha and meditational deity, is arguably the most popular goddess in the Buddhist pantheon. She is considered to be the goddess of universal compassion who represents virtuous and enlightened activity. The Mother Shrine of The Sacred Garden currently holds the White and Green Tara. As a Bodhisattva, she made a vow is to continue to return to this world until all sentient beings acheived enlightenment. 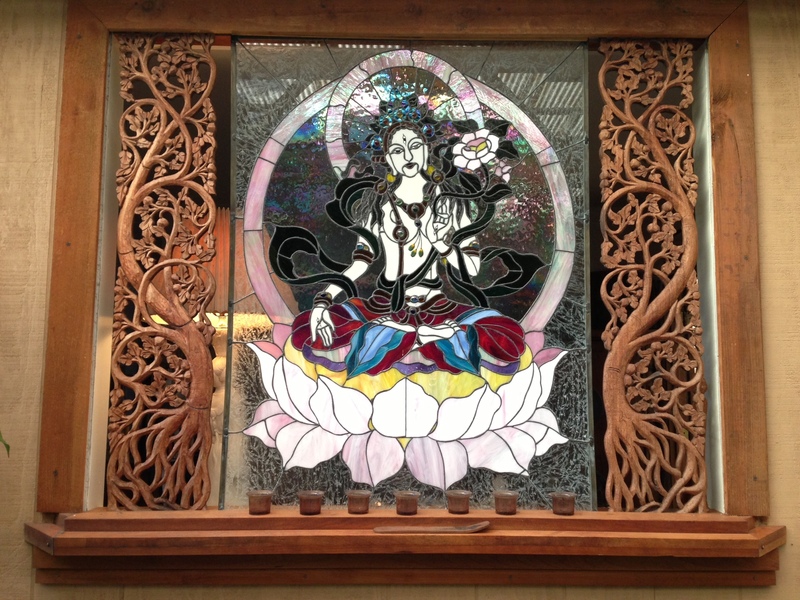 White Tara is the “mother of liberation,” and represents the virtues of success in work and achievements. Her love heals at the source of dis-ease, bringing health, serenity, strength, longevity and beauty. 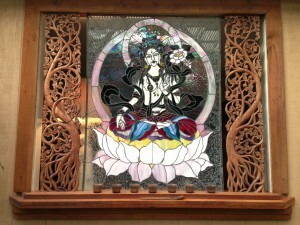 The White Tara evokes the inate desire to share love with all, recognizing our oneness. She is the experience of oneness of all colors, all beings and her love and compassion for all comes from loving herself which is all. She has seven eyes, the two usual ones, one in the middle of her forehead and eyes in her hands and feet. This symbolizes that all of her activities are done with omniscient awareness. She is said to bring health and prolong life. Operating from the space of this compassionate love generates a long and fulfilling life. Green Tara is known as the Buddha of enlightened activity. She is often depicted in a posture of ease with right leg extended, signifying her readiness to spring into action. The left leg is folded in the contemplative position on the lotus pedestal, the two together thus symbolizing the integration of wisdom and art.Her left hand, in the gesture of granting refuge holds the stem of a blue lotus that floats over her left shoulder as a symbol of purity and power. With her right hand she makes the boon-granting gesture. 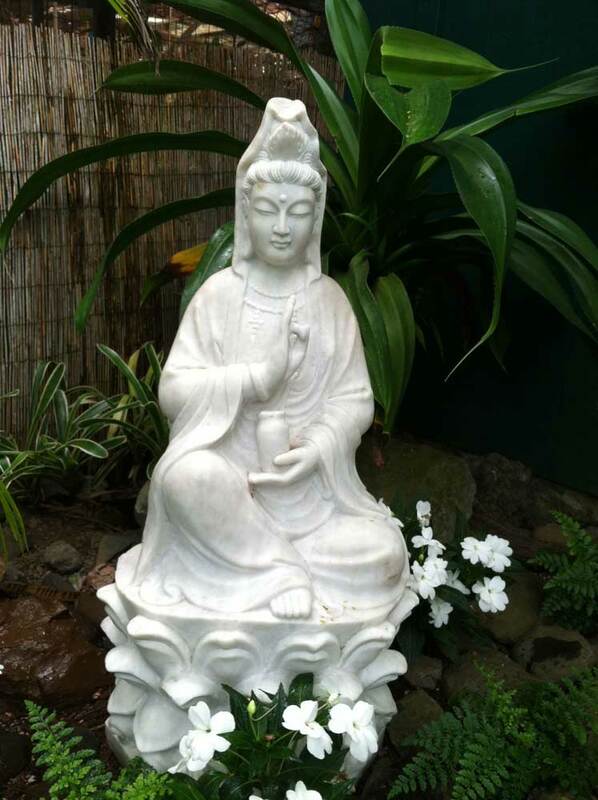 Quan Yin is the embodiment of compassionate loving kindness. As the Bodhisattva of Compassion, She hears the cries of all beings. 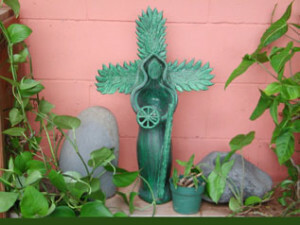 Quan Yin enjoys a strong resonance with the Christian Mary, the Mother of Jesus, and the Tibetan goddess Tara. In many images she is depicted carrying the pearls of illumination. Often Quan Yin is shown pouring a stream of healing water, the “Water of Life,” from a small vase. With this water devotees and all living things are blessed with physical and spiritual peace. She holds a sheaf of ripe rice or a bowl of rice seed as a metaphor for fertility and sustenance. Quan Yin is represented in several places at The Sacred Garden—she overlooks both of the labyrinths and is in the Mother Shrine. Like Tara, Quan Yin, as a true Enlightened One, or Bodhisattva, vowed to remain in the earthly realms and not enter the heavenly worlds until all other living things have completed their own enlightenment and thus become liberated from the pain-filled cycle of birth, death, and rebirth. The Hindu Goddess “Durga,” in Sanskrit means “invincible” or unattainable. The word Shakti, meaning sacred feminine force, and Durga reflects the warrior aspect of the goddess, embodying a traditional male role. 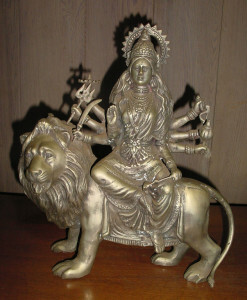 She is also strikingly beautiful and each god also gave her their own most powerful weapons, Rudra’s trident, Vishnu’s discus, Indra’s thunderbolt, Brahma’s kamandal, Kuber’s gada, etc. Himalayas gifted her a fierce whitish golden lion. Mary, Blessed Mother of Jesus, is also honored in the Mother Shrine. In addition to her obvious important role, Mary exudes a loving sweetness and gentle nurturance while simultaneously being incredibly humble. Mary is appropriately honored in gardens as hundreds of flowers were named in medieval times as symbols of the life, mysteries and privileges of the Blessed Virgin Mary, as recorded by botanists, folklorists and lexicographers. Holy Mother, also known as Sri Sarada Devi, was the wife and spiritual counterpart of Ramakrishna a nineteenth century mystic of Bengal. Mother Earth is certainly honored in The Sacred Garden. We appreciate her beauty in every plant, flower, tree, rock, animal, and fish. We recognize her grace in the elements—earth, water, fire, air and spirit. We offer our gratitude to the earth as our home, our caretaker, and our responsibility.